So what do we get on the first day back to work? Yes you guessed it, Sunshine! 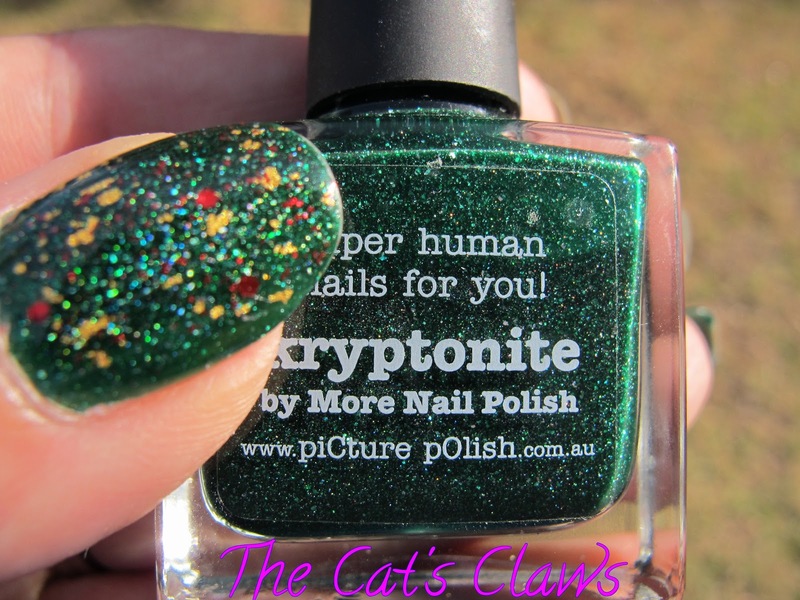 And this means you get to see my Christmas mani in all its holographic glory, that is Picture Polish Kryptonite, along with OPI The Man With The Golden Gun and Models Prefer Ruby Slippers. And another picture just because! 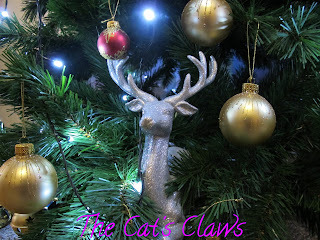 Christmas for me doesn't really start until the Christmas Tree is up and decorated by children! I know this seems strange, but it seems totally alien to me to decorate my own tree, when I have children to do it for me. This year has been extra special because Mr 3 and Miss 2 have done the decorating! And I haven't changed any of their placements either, its all exactly as they have left it. 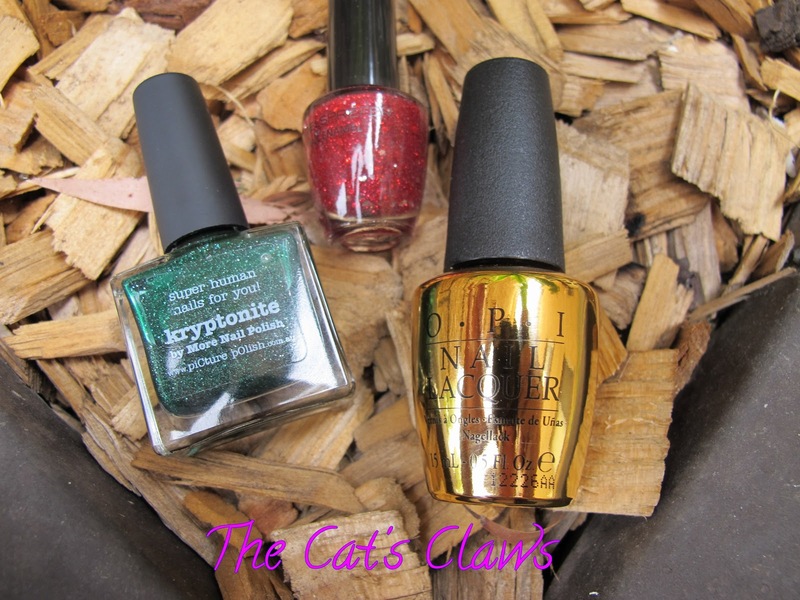 On to my mani, which means the traditional Christmas colours of green for the tree, red for Father Christmas and gold for one of the gifts the wise men bought. Some years I have toyed with other colour schemes, but I always find myself returning to these colours. I'm afraid there are no sunlight pictures as it poured with rain on Christmas day, and today has been very overcast and windy, so unfortunately you are not seeing this particular mani at its best. 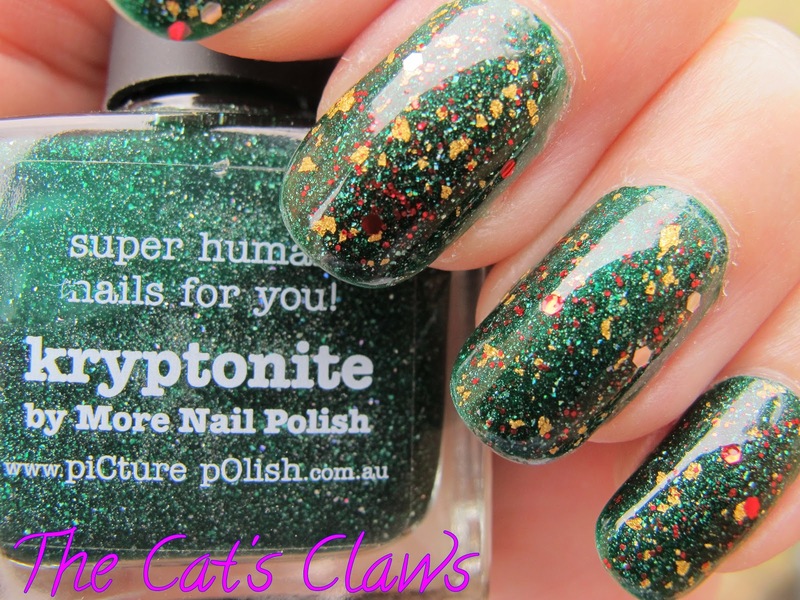 Picture Polish Kryptonite was the only colour I could choose for the tree, it being a beautiful holographic deep green colour. Once again this was three coats even though two would have been enough. Then one coat of OPI The Man With The Golden Gun, a real 18ct gold flake topcoat. Lastly one coat of Models Prefer Ruby Slippers a fine red glitter with tiny red and silver hexs. Plus a top coat of Seche Vite to smooth it all out and make it super glossy. Day three and Fairies were the order of the day for Miss 2. 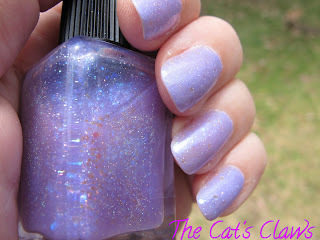 And I had just the polish that had captured said fairies in a bottle, can you guess who had? Lynnderella, although the name was a very unfairy like Bride of Franken! 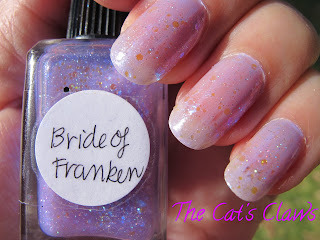 I wanted to do something very sheer and ethereal looking, so I used one coat of the un-named purple from the Chi Chi Pastel Collection and then two coats of Lynnderella Bride of Franken followed by a Seche Vite top coat. When I saw just how much the sunlight had washed out the colour, I added another thin layer of Chi Chi Pastel Collection purple followed by two coats of Lynnderella Bride of Franken and Seche Vite top coat. 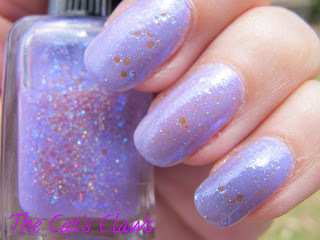 Even though I ended up with eight layers of polish, this still looked very sheer and magical. And speaking of magical, Mr 3 and I also now know "How to Train your Dragon"!! Along with being able to put transformers back together again! Miss2 along with her brother Mr3 and their parents came to stay with us for a short while in order for us to have our Christmas early. 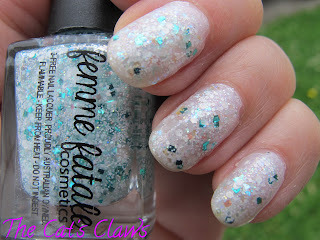 Miss2's choice on day one was Victoriana's Steel Reverie a sheer pale pink with a ton of holographic sparkles and bar glitter. Mr3 also decided that this polish was right up his street so he too, was also polished to perfection. On day two, whilst Mr3 and his dad were out fishing (they caught puffer fish if anyone is interested) Miss2 decided on pink polish. 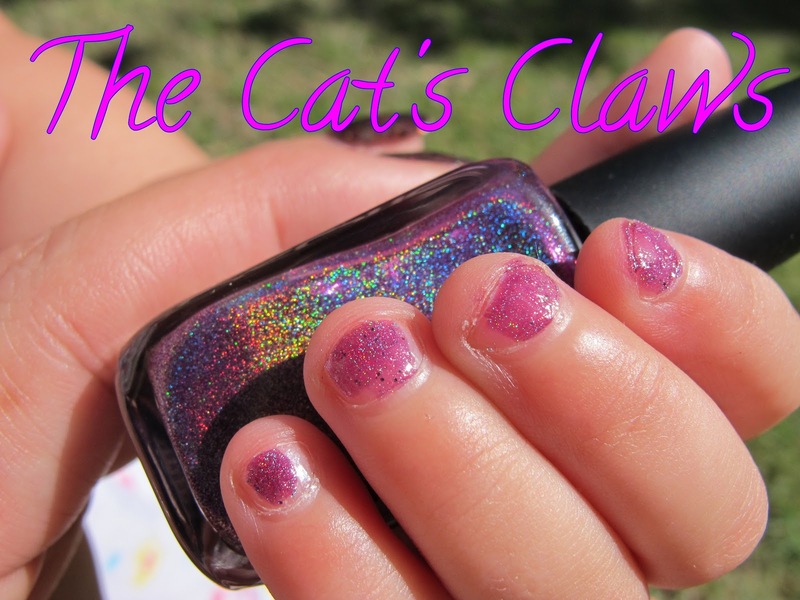 And after much consideration of the pink/purple drawer of 38 polishes Miss2 made her choice and here it is in all its holographic beauty Ozotic Pro 513 which is now sadly discontinued. 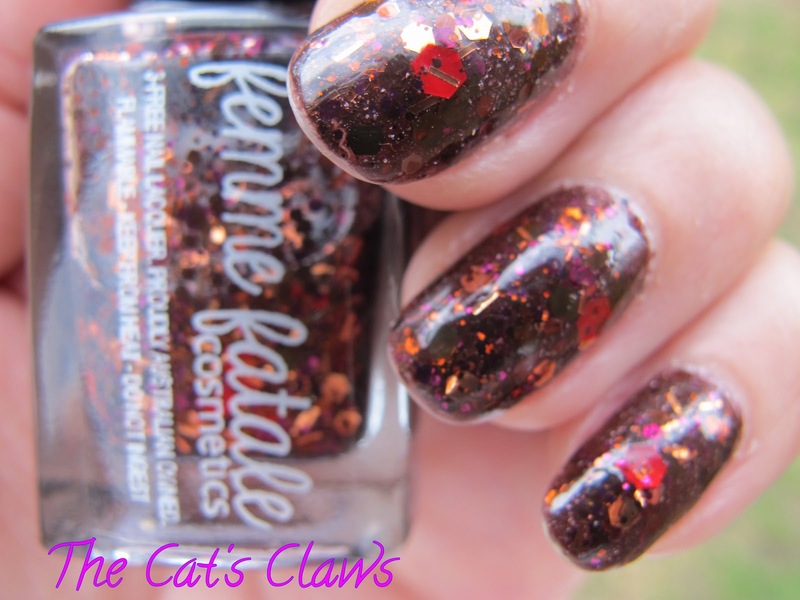 And this is Femme Fatale's Stolen Reindeer, a beautiful brown glitter with copper hexs and string glitter along with some fuchsia hexs and a smattering of large red hexs for Rudolf's red nose. Which makes this polish look very jewel like in low light. And a sunlight picture where you can see the colour is very rich indeed. This was two coats of Picture Polish Demeter with one coat of Femme Fatale Stolen Reindeer and two coats of Seche Vite to make everything ultra smooth. 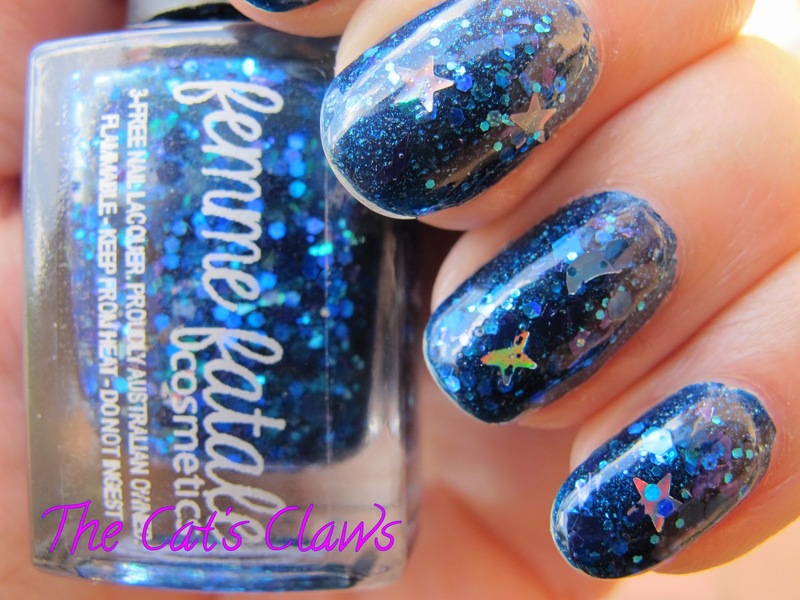 If I had to choose a favourite polish out of this Christmas Trio it would have to be A Frosty Shake, because of the pearlized glitter and turquoise square glitter. 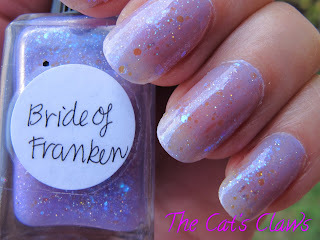 Even with no sun you can see that Femme Fatale A Frosty Shake is beautiful! 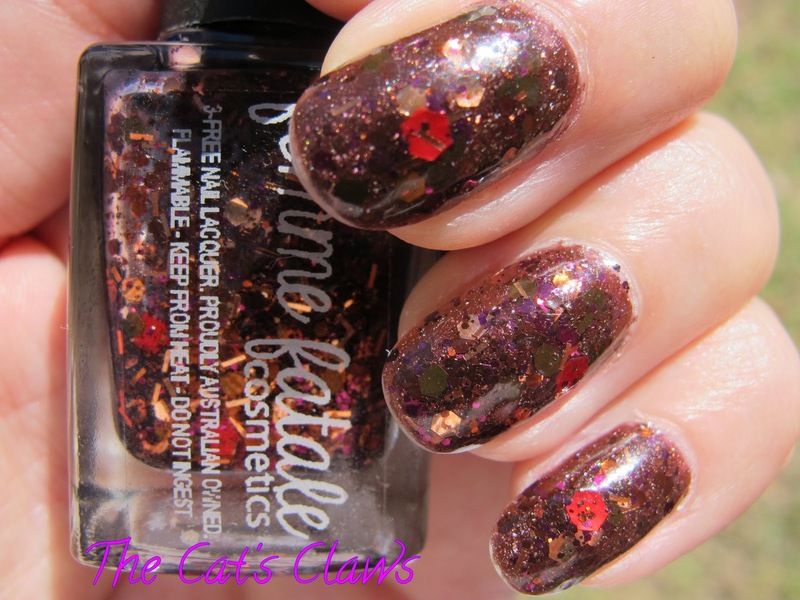 When I first saw Femme Fatale's Christmas Trio I wasn't that enamoured with A Frosty Shake but with each stroke of the brush I found myself loving it more and more. It has a soft gentle beauty all of its own and to my mind looks like glistening snow in the sunlight. This is the first white mani that I actually loved and have posted here. So this mani was two coats of Picture Polish White Wedding, then two coats of Femme Fatale which has pearlized large and small hexs, mint green leaning to turquoise squares, plus a load more sparkle dust. Followed by a coat of Seche Vite. I have found Femme Fatale's polishes beautifully constructed and with no need to fish for anything. 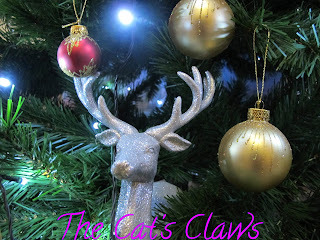 My next post will be about the last of the Christmas Trio, Stolen Reindeer. In looking around at all the Christmas Collections currently being touted on the Internet from various Indie brands- the one that caught my eye the most and with such cute names like Stolen Reindeer, Suspended Starlight and Frosty Shake quickly became a "I couldn't live without" was Femme Fatale's Christmas Trio. This was my first purchase from Femme Fatale and I must just say shipping was ultra quick. 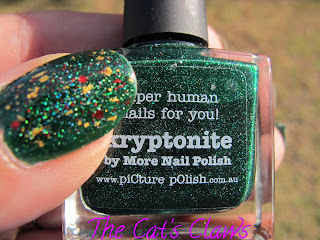 There is no need to guess which polish I tried out first! 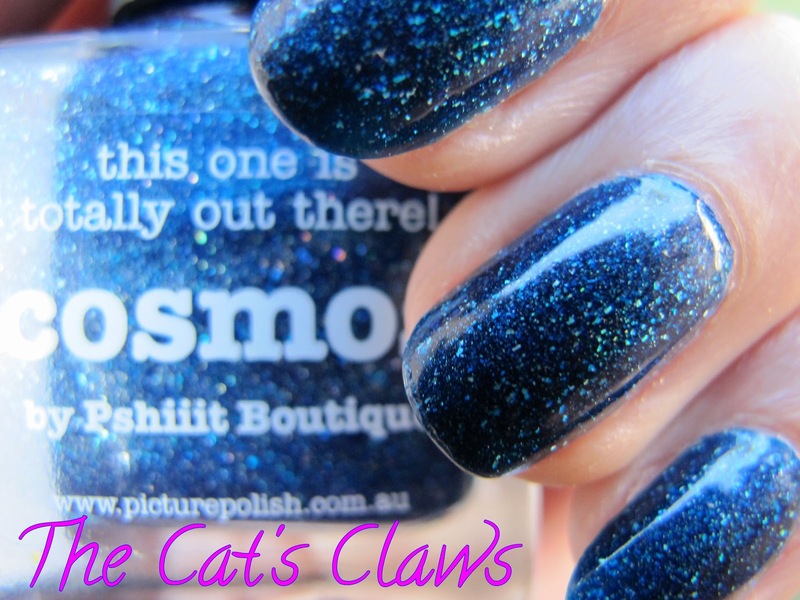 Well it only seemed fitting since I was still wearing Picture Polish Cosmos to layer Femme Fatale Suspended Starlight on top. 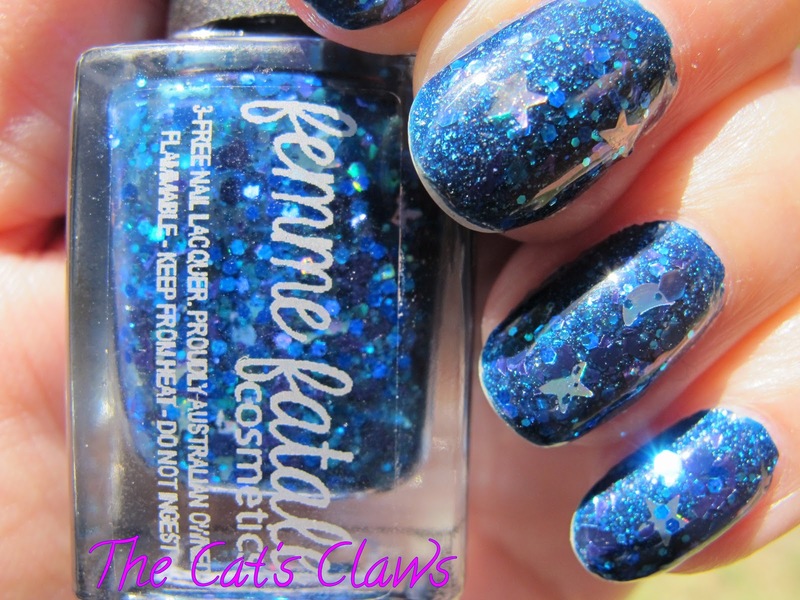 This was one coat and I didn't even have to fish for the stars and moons at all, which by the way are holographic! There is also dark blue,green and purple glitter too, which are all the extra sparkly kind. And then two coats of Seche Vite to smooth it all out. This one is totally out there! 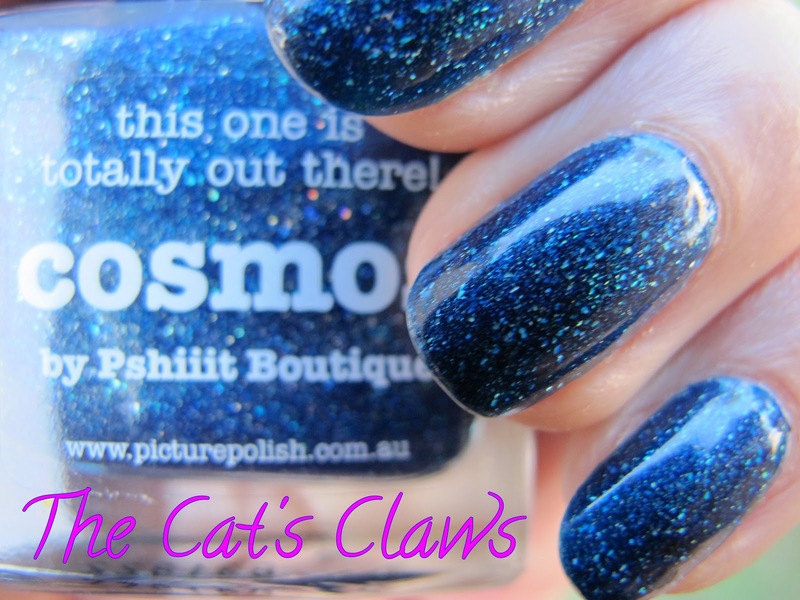 Picture Polish in collaboration with Pshiiit Boutique have thought up the most beautiful royal blue polish and if that wasn't enough they then loaded it up with scattered holographic particles! The result is one spectacular nail polish going straight in to my Top Ten of all Time. 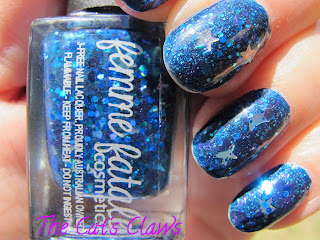 A sunlight photo, where you can see how beautiful the blue is but the holographic goodness has been washed out a bit. 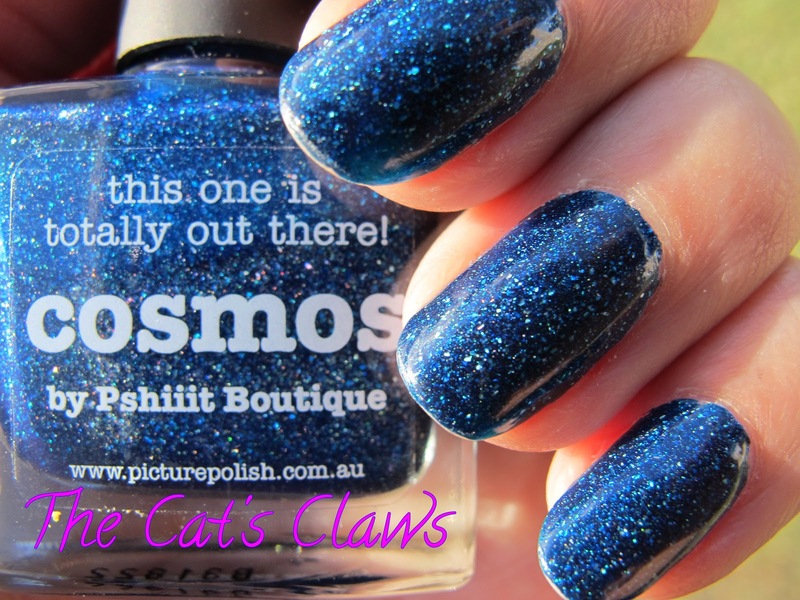 This was three coats of Picture Polish Cosmos although two would have been more than enough, but I wanted the depth of looking in to the Cosmos, followed by a top coat of Seche Vite which has not dulled the holographic particles at all. Trust me this is an absolutely stunning polish and I only wish my photos could have captured it's real life beauty. In the sun the holographic particles are absolutely blazing! So where can you get your hands on this beauty? You can visit any of the links below to see what other wonderful goodies they have. 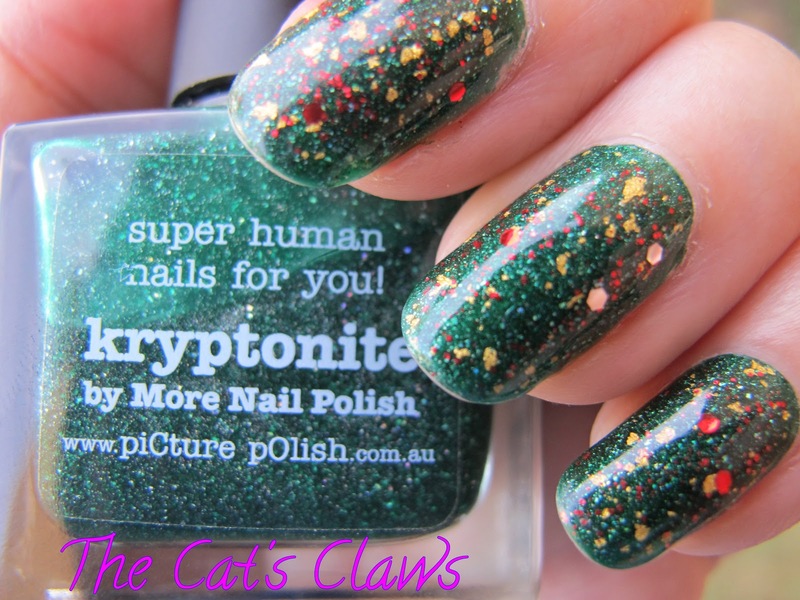 I personally have more than a few of their polishes in my Top Fifty! 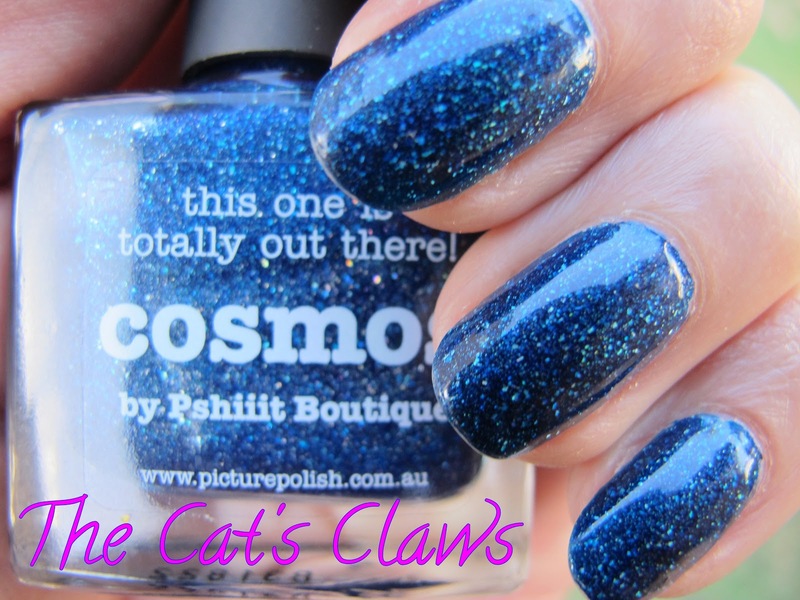 Like us on Facebook - piCture pOlish - a week on your tips never on your hips! 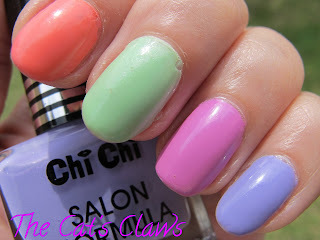 How pretty are these Chi Chi Pastels? They are super gorgeous and drew loads of comments at work; ranging from "schizophrenic nails" to "I used to do that in the sixties" and the guys certainly noticed too! 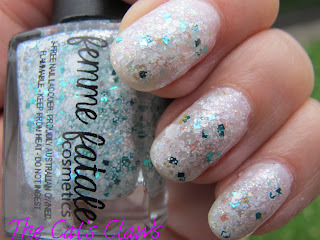 I can't really take all the credit because I actually saw this mani on Konadlicious' Blog and whilst I definitely wanted the pastel collection I was a bit chicken to try out this out, until I thought what the hell who would notice!! Chi Chi also have two other collections out at the moment one is Brights and the other is Glitter, all three collections are currently $15 in Target. 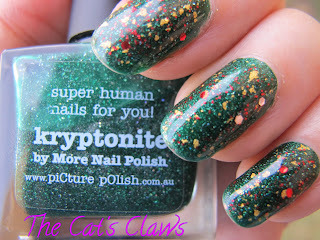 And to prove I have a right hand, here are the other four colours in the collection. 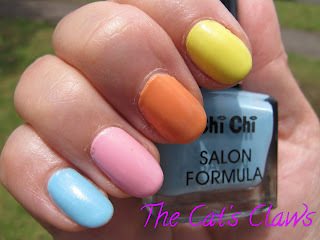 And so on to my mani, each colour was three coats followed by a Seche Vite top coat. All the colours applied perfectly and my favourite out of the bunch if I had to chose would be the light purple one.